Julie has had a personal relationship with the healing power of anti-inflammatory foods ever since she was a little girl. After her mother switched her from artificial and high sugared foods to natural foods, an immediate change was noticed in her behavior and energy levels. However, this wasn’t Julie’s only encounter with food affecting her body in a negative way. After returning back to sugar and experiencing a horrible bout of food poisoning, Julie learned once and for all to listen to her body and began eating anti-inflammatory foods to heal it back to normal health. Continuing with these foods, Julie’s health is at its best and she works hard to help other people also listen and understand their bodies for a healthier lifestyle and to appreciate the healing power of food. Want to learn some of Rob and Devon’s top healthy recipes, favorite workouts, and tips for accomplishing goals? Leave us a review by texting OSFreview to 33444 to get a free copy of our Jump-Start Guidebook. After you text OSFreview to 33444, you will get the link to leave us a review or message. On that same text from 33444, just respond back with your email address for us to send you a free copy of our Jump-Start Guidebook. It’s as simple as that! 26:53 Julie’s background story and relationship with food. 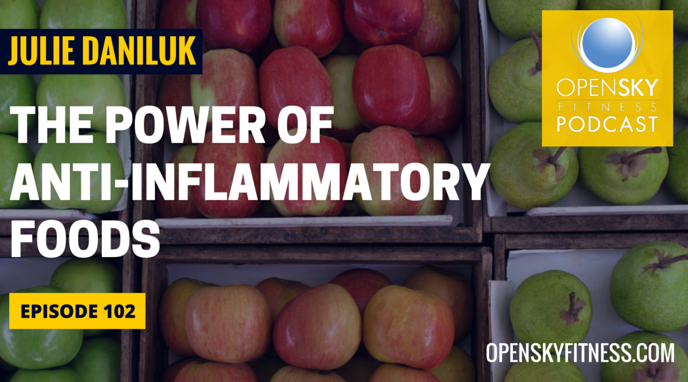 29:10 Julie’s childhood switch from artificial foods to anti-inflammatory foods. 35:15 What’s inflammation? Julie explains. 41:20 Do you think the average person doesn’t even realize that they’re having an inflammatory response to food?